There are a number of ways you can mitigate hazards when it comes to hazardous materials storage. U.S. Chemical Storage can help you understand what to look for and what practices can help you maintain a safe environment within your facility! Storing hazardous materials is an important job. These substances are important for our economy, and often bulk hazardous materials storage is a must. Whether you store large quantities, or small amounts of hazardous materials, adhering to safety guidelines can lessen the dangers these substances create. Proper housekeeping is essential in safe hazardous materials storage. Keeping incompatible substances separate will prevent hazardous chemical reactions from occurring. This includes cleaning up any spills or leaks, keeping hazardous materials from entering the water supply, and keeping substances from touching the floor. Practice good housekeeping skills to maintain your hazardous materials storage and keep your storage area safe and compliant. Understanding procedures in hazardous materials storage will enable you to properly and safely handle your hazardous substances. Knowing what materials are flammable or explosive and what materials are water-reactive allows you to store your hazardous materials accordingly, avoiding dangerous incidents. Signs can help alert personnel to potential hazards, but knowing the dangers and avoiding them is a great step towards safeguarding your facility and your community. 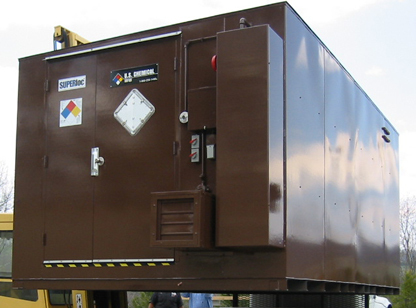 U.S. Chemical Storage offers customized buildings for your hazardous materials storage. These buildings are a safe and compliant hazmat storage solution. Our designers will work with you and understand your needs according to what hazardous materials you intend to store. For enhanced safety, our hazardous materials storage accessories go beyond regulation. Warning signs can draw attention to danger and promote safe practices. Ventilation and climate control can maintain the environment within your hazardous materials storage building, maintaining your substances and mitigating dangers. Every client has different needs and every substance has different storage requirements for maximum safety in the workplace. Understanding the hazards associated with each substance is the first step to protecting your personnel, inventory, and equipment.